Many people get dental implants so that they can have a beautiful smile. A dental implant is the most common solution for people who are missing teeth or don’t like the way their mouth looks. The implant will be put into the jaw bone, and this will heal around them to keep them secure. This is why the implant feels like it is a real tooth. But, you might be wondering what reason might cause someone to go and get dental implants? Well, there are a lot of reasons, but we’ve come up with some of the four most common ones. So, if you are curious about the reasons behind this, read on! One of the most common reasons for a person to get dental is that they have some teeth missing. There are a number of ways that a person can lose some of their teeth, but a lot of the time they might not feel comfortable with their smile. Because dental implants are placed into the jaw bone, it might not be possible to tell that it isn’t a natural tooth. Not only will this tooth look natural, it will feel natural, as well. Dental implants can make you feel more confident with the way you look when you smile. There are a variety of dental diseases that someone could suffer from, and a number of these might cause visible issues, leading to people’s decreased confidence in their smile and even significant dental pain. Contact our office to see if dental implants may be an option for you if you’ve experienced periodontal disease, as some types of disease may rule implants out as a viable option. Dental trauma is the injury to the teeth, or the gums, as well as things such as the soft tissue in the lips and the tongue. When people have dental trauma, they may wish to replace a single tooth or several teeth. Depending on the type of trauma that you have experienced, our dentists can help determine the best course of action and decide if implants may be a good choice to help restore your smile. When someone gets dental implants, they may last a lifetime if they are cared for properly. That is one of the reasons that these are such a popular choice with people who have missing teeth, have experienced dental trauma, or had dental disease. It provides you with a solution that doesn’t have to be changed or redone in a couple of years. Much like caring for your own natural teeth, you’ll need to brush and floss as well as maintain a regular schedule of dental visits. We hope that you have found this article helpful and now understand 4 of the reasons that people get dental implants for a new smile. 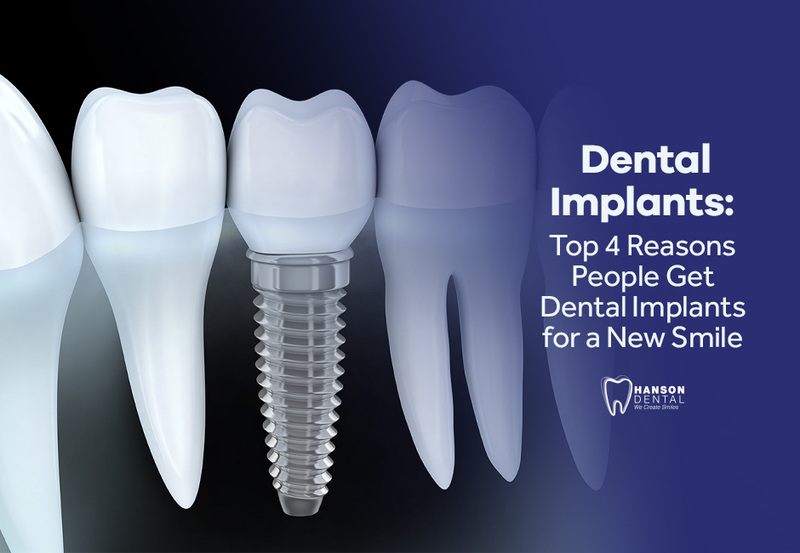 Thanks for pointing out the top 4 reasons people get dental implants. My mom is considering getting dental implants and I am trying to research them or her. I think it would be nice to have a permanent solution to help her smile.